This was a marvelous mystery with a flavor of love. Ms. Gloag did an excellent job portraying clues to the riddle of the Grangers hostility toward Deborah. It was easy to get swept up into the power struggles and to hang on with bated breath. Reminded me of a good Agatha Christie mystery. I particularly enjoyed it when Deborah would reason out her theories out loud. Even I could follow along. Naturally, I loved the interactions between Deborah and Julian. Each has loved the other since their teen years but doubt the other has any close feelings. Watching them grow closer and acknowledge their deep love was a victory of their hearts. I was given an ARC in exchange for an honest review. Deborah Stavely has been widowed and is competently running her late husband's lands, until she starts receiving threats from her neighbours, the Granger brothers. The eldest Granger demands that he marry her immediately or he will start hurting her tenants and destroying her land. Her brother, Lord Freddie Worth, discovers the threats when Deb's butler informs him and writes to his friend Julian Fanshaw to come help. Julian is an old family friend and has just returned to England, both he and Freddie went to school with the Grangers and so hope that there past experiences will help them solve Deb's current situation. However, the threats run deeper than they appear; at first Julian and Freddie think that the Grangers are seeking revenge on them through Deb for something that happened back in their school days. However, it turns out that there's more to the story and Deb's live is in serious danger. Deborah was in interesting character, in that she was absolutely determined to do things by herself; she resented her brother for getting Julian involved in something she believed she could handle on her own and went out of her way to manage things before any one else had to get involved. Her determination and stubbornness made her a fairly strong female lead for the story. Julian was the character I related to more of the two, I'm not entirely sure why. I liked that he seemed so willing to help however he could because of the history that he shared with the family. I feel that, as a reader, I was given more of an insight into Julian's mind from earlier on in the novel so it was easier to see things from his point of view throughout. I enjoyed the relationship that built up between the two protagonists - both remembering how they had felt when they were younger and feeling confused by how that affected them now, and both as stubborn as the other in terms of seeing the other's struggle with the feelings between them. Julian's protectiveness of Deborah was endearing throughout, and Deb's internal struggle between how she actually felt and how she thought she should feel was well played . The one thing that slightly disappointed me was how little interaction we got from them once their story had been resolved. The end felt a little rushed, I would have enjoyed seeing a little more of the conclusion before the story was cut short. 5 out of 5 starsGreat Clean Love Stories! 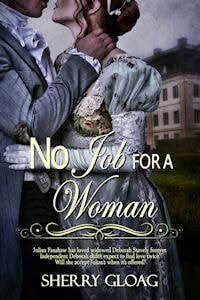 No Job For A Woman - 5 stars - This story was well written and the characters well developed. The author drew the reader in and kept our attention until the end. The author allowed us to experience her characters many emotions. The story had intrigue, suspense, danger, violence, betrayal, murder, discoveries, love, and a happily ever after. I read this story as part of an anthology. It's a sweet-romance regency filled with well-developed characters and plenty of action. I don't believe in reviews that contain spoilers or repeating what you can read in the blurb, but I recommend this story...enough that I intend to buy another of Ms. Gloag's books! No Job For A Woman, a well-written Regency suspense story featuring a bold and unconventional woman, a marriage-wary war hero and a really horrific villain. Deborah, a widow finds herself soon under the attack of her neighbors, The Granger's as she tries desperately to run her late husband’s estate. While a single lady trying to run an establishment is severely looked down upon, she never backs up one step, always pressing forward to do what she feels is right. Whether kidnapping, losing an inheritance or other issues, this story goes deep into the life of Deborah as she opens herself up to the reader. She is a very independent lady who desires to take care of what is rightfully hers, but sometimes things become larger than even she can handle. When it seems as though Deborah is in dire straits, her brother has a good friend, Julian, that steps in to help by offering to marry her and protect her assets from these rough neighbors. While there are several ups and downs throughout the story, the reader will become attached to this endearing damsel in distress and finds oneself pulled into her life, cheering for love to truly develop. The theme of the support of family and friends can be found as everyone steps up to help as best they can. While the story is good, the flow is somewhat slow and awkward at times causing a plodding pace and hindering the interest while reading. The best words of the book are found at the closing when Julian asks Deborah: "Have I told you yet today, that I love you?" What a beautiful ending to an overall good story!